I was born in 1960 in Montevideo, Uruguay. An exhibit of Alexander Calder’s work gave me my first, and longest-lasting influence in art. After the show I went home, painted my first “sunny-side-ups”, and converted them into clocks. I was seven years old. By ten I was painting the glass of my watch with beautifully-colored markers. In the process I also managed to decorate my shirt sleeves – an art project my mother did not appreciate. I made my first seconds-meter-machine at age fourteen. It had an old, enameled face with only one hand ticking the seconds away. Below it a sign read: Ars Longa, Vita Brevis ( Art Lasts, Life is Brief). It could not have been more apropos for a young artisan who is still, today, fascinated by the integration of art and time. From 1985 to 1990 I attended the School of Liberal Arts in Montevideo, where I experimented with photography, video art and sculpture. It was there I conceived and built my signature work, the Slow Reading Clock: a piece comprised of three, one-handed dials, each dial reading the hours, minutes, and seconds respectively. It was a natural step toward the beginning of my company, Watchcraft (R)…. But alas, vita brevis… so between family and work, I still manage to find a few moments “on the dial” to experiment with photography, and if I can, get my shirt sleeves dirty with something new. 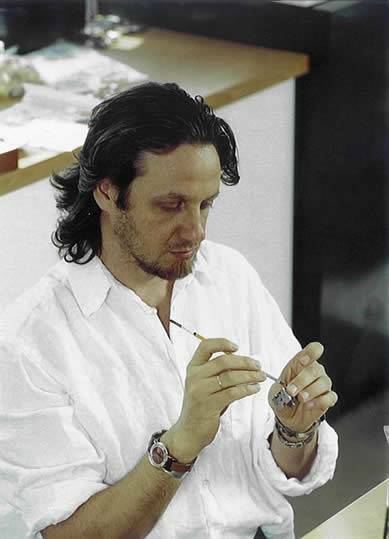 Today a line of more than 100 unique watches are crafted in my New York City studio. Watchcraft (R) is represented by over 400 galleries, and museum stores around the world.